I was excited. My new embroidery boutique, In Stitches, was almost ready for its grand opening. Gleaming new sewing and embroidery machines were rowed up, ready for customers to discover. Every day, more spools of thread, made especially for embroidery machines, arrived. I had embroidery hoops, stabilizers, specialty scissors, and bolts of fabulous linens and cottons. For a fabriholic, this was all a dream come true. Not only that, I could cross the street and browse in the other Threadville shops—The Stash, Tell a Yarn, Buttons and Bows, and Batty about Quilts. There was no end to the beautiful textiles and crafty possibilities in Threadville. Like my (slightly quirky) colleagues, I was going to teach classes and workshops. I hoped my original thread art would inspire my students to buy machines and supplies from me. With all that I could have been doing, all the fun I could have been having in Threadville, I daydreamed out my back window. My yard was covered in snow, surrounded by hedges, and went all the way down the hill to the hiking trail beside the river. I focused on Blueberry Cottage. I planned to renovate it and rent it to tourists. Who wouldn’t love staying in a cute little cottage, only a short walk or canoe ride to a sandy beach? The most exciting thing of all was that I could finally have something else, besides my own embroidery boutique, that I’d wanted for a long time. Thousands of dogs were waiting to be rescued and taken to their forever homes. What kind of dog do you think would enjoy greeting customers in my shop, playing in a big, fenced-in back yard, and accompanying me on long walks on trails and beaches? I like that everything coming into place. Dru, I love Threadville's other textile and craft shops, and I hope others will love In Stitches and enjoy shopping and taking courses. Willow, how about a nice cozy cat instead? Cats don't have to be walked when it's snowy and blowy. Plus, cats purr! But if you're set on a dog's companionship (and don't get me wrong, I love dogs :) I vote for a mutt from your local animal shelter. A cat? Hmmmm. Hadn't thought of that! I want a walking companion, and will definitely get a rescue dog from a shelter. But which shelter, and which dog? I want to rescue them all! Cats, too . . .
A python! Just perfect for a sewing shop! Or . . . maybe not. Willow, it sounds like everything is coming together perfectly! I can't wait to have a peek into your shop. Now, a dog. Well, truthfully, only one kind of dog comes to mind, because I have a real soft spot for them - black labs. Super friendly and great people dogs, but have a big dog bark to scare off strangers. But if you could find one at a shelter, that would be even better. Shelter dogs desperately need homes. I'm partial to greyhounds--sweet, loving, friendly, and pathetically grateful to be rescued. Or you could adopt me, let ME greet your customers and all that. 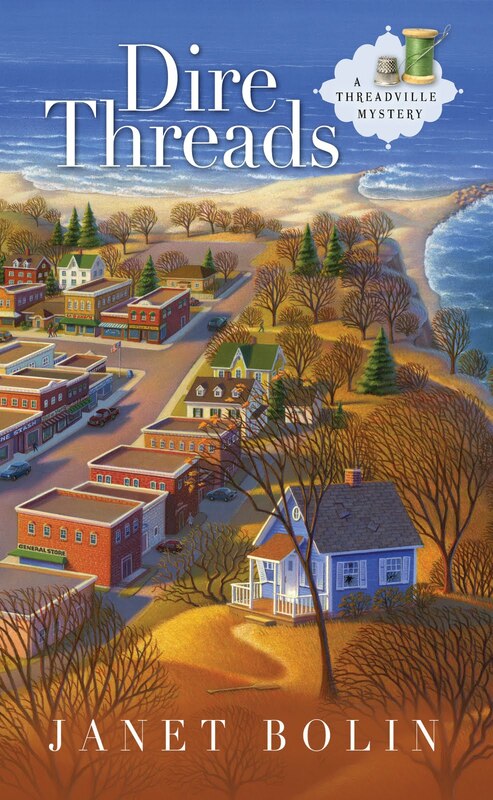 I'd love to spend my days in Threadville! Willow - what a gorgeous picture you paint. I cannot wait to visit your shop and meet all your quirky neighbors. My suggestion is the same as Jen J's. We had the most wonderful black lab/mix up until about a year ago (sniff). Just the best dog, best companion, and most loyal friend you could ask for. I don't know what she was mixed with, but she wasn't very big. Had that big dog bark, though! The dog you pick will be lucky indeed! Okay, that was weird. My post went away. Harumph. I'm picturing Golden Retrievers, Labradors, or even frisky happy Beagles. Or maybe a Sheltie or a mutt. I adore mutts. What a lucky rescue puppy! Yay for you, Willow. I'm voting for a cat, being partial to them, but I did have a Siamese who ate thread, even with the needle attached...so maybe not so great for your shop. No personal dog recommendations although I do know of two mischievous but darling dachies. Your pal Charlotte Adams might have some advice. Sounds like a great idea, though! i vote for a cocker. big dog voice in a compact package. I'm going to have to quit my job to read all these great books being suggested. Jen and Julie, yes, labs are great, whether yellow, black, or chocolate (the color, I mean.) Good idea! Laine, greyhounds sound very fast, and I might not be able to keep up with one, but I'd love to have you greet customers in my shop! Avery, maybe I can find a combination of all the breeds you mention. I like mutts, too, and there are sure to be plenty to choose from in a shelter. Erika, I definitely wouldn't want a cat swallowing a needle and thread. Dogs woudn't do that, though. Oh, wait . . . I think I'll look for a grown-up dog, not a puppy. And I love Charlotte's daschunds, too. Good suggestion, Erika and Melissa. But those darling little short legs? I might have to walk too slowly for one to keep up, and would I dare run? Rowena, are cockers big enough to run with me? Carole, I'm thinking of giving up *sleeping* to read all these books! I'm partial to boxers. They're super sweet and friendly, and love love love people. In fact they think they ARE people! How about a dog *and* a cat? Good for all moods... LOL! I have been giving this a lot of thought. You need a dog who will bark as an alarm, one who will be friendly and welcome all your customers, and one who can run with you -- a Jack Russell Terrier! Misa, I think I would like a big dog, but boxers are really big, right? Victoria, I'm afraid of going to a shelter that has anything besides dogs. I could come home with an entire menagerie. Ooh, Krista, you're right. Jack Russells may be small, but they can really run. And even if the dog runs faster than I want to, he or she wouldn't pull so hard on the leash that I'd go flying. I hope.